In honor of the official “First Day of Fall” on Saturday, September 22, let’s fall into seasonal changes in wetlands! When many people think of the transition from summer to autumn, the first thing that pops into their heads is leaves changing colors and seeing more sweaters and long pants. A less common thought is how wetlands change in the later months of the year. From species composition to hydrology, many wetlands undergo radical changes when summer turns into fall. 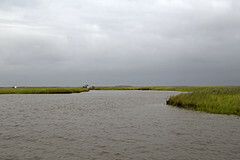 Wetlands in coastal Louisiana are no exception. For a start, seasonal changes can be observed with migratory species. Many species of birds and some fish and crustaceans use our swamps, estuaries, and other wetlands for breeding habitat in the summer months because of the abundance of food and warmth. On the other hand, some migratory birds like the famous Bald Eagle use the Mississippi River Delta as a wintering ground. Blue Crabs, another species found in wetlands, mate around this time of year before going dormant for the winter. Migratory birds are starting to migrate back to the southern hemisphere around this time to follow food resources. Decreasing temperatures and humidity also cause plant communities to change. Wetlands experience loss of vegetation from wilting and freezes. Black Mangrove distribution is limited by minimum winter temperatures. You can read more on mangroves and freezing here. Swamps and marshes lose much of their greenery with lower temperatures, which really decreases their water storage potential. Evapotranspiration, or water vapor leaving plants through their leaves, often decreases too, which means that water is not being cycled as quickly as at other times of the year. Ecosystems in a stable state can weather the changes between seasons and bounce right back to full productivity in their peak season, but sometimes a large disturbance or even small, incremental changes over time can degrade habitat to the point of no return. Degraded wetlands provide less storm buffer, which is a crucial ecosystem service that protects us during hurricanes. It is in our best interests to preserve our wetlands through projects like CWPPRA because they are so critical and invaluable to us. While there are some people who cannot spend enough time outdoors, enjoying all of nature’s gifts, there are others who need a little more motivation to get outside and seek the beauty of our outdoors. What better time for either party to embrace the outdoor spirit of America than in the month of June, Great Outdoors Month. The month kicks off with a Presidential Proclamation, which advocates for all Americans to visit the great outdoors and to protect our nation’s legacy by conserving our lands for future generations. The Proclamation discusses the numerous possibilities for Americans to explore, play, and grow together through outdoor activities. Any activities from hiking to canoeing to wildlife watching, hunting, or fishing can involve kids by being healthy, active, and energized. More and more Americans are seeking healthy and fun outlets as ways to stay active. The outdoor recreation community is situated in an exemplary position to help people lead a healthier lifestyle by welcoming them and providing guidance on how to take advantage of the great outdoors. Wetlands provide recreational opportunities such as fishing, canoeing, hiking, bird watching, and waterfowl hunting, just to name a few. One of the largest and most avid groups of people using wetlands is waterfowl hunters. There are an estimated 3 million migratory bird hunters in the United States. This year, new studies by the recreation community will record data on the key role outdoor recreation plays in local, state, and national economies. Outdoor recreation is an economic powerhouse in our country generating nearly $887 billion in consumer spending each year and creating 7.6 million jobs. Great Outdoors Month is designed to highlight the benefits of getting involved with our great outdoors and enjoying natural resources, such as forests, parks, refuges, and other public land and waters.